Spend the night aboard a historic tugboat! 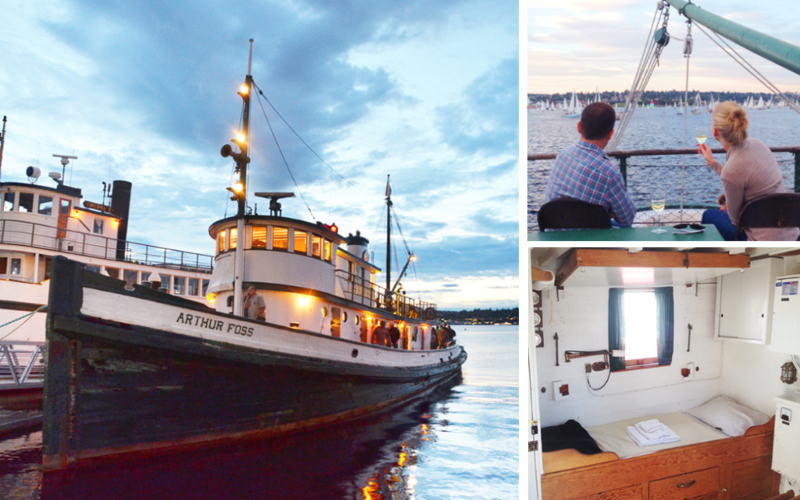 Experience a night aboard the 1889 tugboat Arthur Foss and learn about life as a “tow boater.” Docked at South Lake Union, the tug has excellent views over the lake and the heart of Seattle. Whether staying one night for an authentic Seattle maritime experience or living aboard during a workshop class, the Arthur Foss provides both accommodations and a slice of Puget Sound maritime history. Participants receive an orientation and tour from engine room to wheelhouse from members of our knowledgeable crew. The tugboat has largely the same amenities it did in the 1930s, including in-cabin sinks and flush toilets in the main heads, but has been improved with hot showers, fresh bed linens, and a few modern conveniences such as a microwave. Plan on bringing meals or eating out, an extra blanket, and other overnight necessities. Spending the night aboard Arthur Foss is a great way to learn about a classic American story, the neighboring historic vessels, Lake Union’s cool environment, and modern Seattle…all just over her gunwale. Choose between crew (two bunks per room) and officer berths (single bed with desk). - Discounts: 25% off for Northwest Seaport members. Planning an event, such as a birthday party, family reunion, or informal business meeting? ​Arthur Foss is a great place to gather with your guests. Evening rental is $400 for the whole evening. Deposit: A 30% deposit is required for all reservations. Dates: June 1st to October 1st, 2018. Some blackout dates apply including July 1st-4th. Registrations: Use Contact Form to inquire.